Among those cities were many formerly affordable suburbs, including Markham and Mississauga (greater Toronto), and Burnaby and Surrey (greater Vancouver). While the methodology used by Huffington Post is dubious to say the least, I think their point is valid in that detached homes are way out of reach for the average Joe in places like Toronto and Vancouver. But that was kind of always the case. At least in the recent history. In 1997 the median household income in Toronto was about $43,562 (nominal), the SFH median price was about $225,000 and the 5 year fixed mortgage rate was 7%. With a 5% down payment, monthly mortgage payments would have been $1,510. Annually, mortgage payments would have consumed 42% of pre-tax income. In 2014, the median household income estimate is around $70,000, the median detached price was $610,000 in February 2014, and the 5-year-fixed-mortgage rate was 4.32%. Monthly mortgage payments on a median SFH would be $3,162 and that would take up 54% of pre-tax median income. Now if interest rates were to return to 7%, a median detached home in the GTA would consume 70% of pre-tax income. Affordable housing in Canada is defined as spending no more then 30% of pre-tax income on all shelter related costs. Above I just looked at mortgage payments alone while not including property taxes or utilities. All in all, detached homes were unaffordable back in 1997 according to the CMHC definition. They aren’t who you think they are. Condo investors are largely Canadian residents and can range from a young buyer who may have saved up $30,000 to a mature adult who has $500,000 invested in a portfolio and is not getting the return they hoped for. Some are parents who have bought a unit for their children to live in while they attend university. “It’s anyone searching for financial freedom,” said Kozaris. “Of the last 20 deals I did, 19 were with people who met with me in person,” noted Amit Bhandari. “I’d say all but about two per cent of them have SIN numbers and local driver’s licenses,” added his brother Roy. See, even real estate agents agree that foreign investors are a myth. According to TalkCondo the number of foreign investors present in a pre-construction condo market is somewhere around 2-5%. If you still believe that foreigners drive home prices in Toronto and Vancouver then please explain why home prices rose even more in places such as Sudbury, Saskatoon and St. John's. 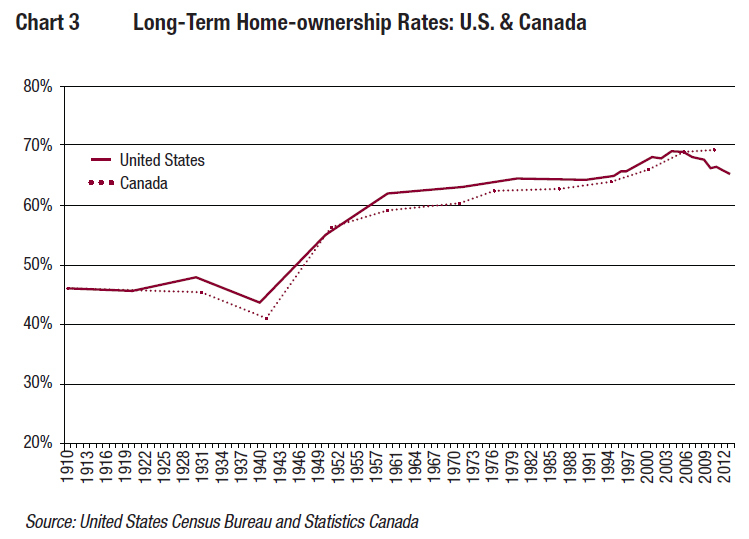 In 1921, Canada’s home ownership rate was 46%, the same as the U.S. The two lines of the subsequent history of these rates track very closely, as they rise over time. Canada reaches 69% in 2006, as the U.S. did in 2004. But then the histories diverge. Canada had a housing price correction in 2008-2009, but not a housing bust. It did not have a housing finance collapse. Its house prices recovered, and then have gone marching upward to ever higher levels up to now. Its home ownership rate held at 69% in 2011, our most recent report. Are Canadian house prices now in their own bubble? Many observers think so. Will it deflate or collapse? If so, home ownership will probably fall, as happened in the U.S. and England–perhaps back to the mid-60% range? I think that the US and Canada are much more culturally similar then commonly believed. That matters because home prices are greatly influenced by mass perception of homeownership. In my view it's not the low interest or availability of credit that are the main drivers of property appreciation but a public belief in a continuation of price growth. There is not a chance that any western country can, or will, increase their central bank rates anytime soon or they risk putting their fiscal house and economies in peril. In short, they won’t be able to fund or finance their debt. For most countries, this deleveraging will take years – many years. Oh, is that right? So until western governments pay off their debts, independent central banks won't raise their rates? And never mind a risk of spiking inflation. What does the end to real estate bubbles mean for investors? Is Canada now the first country in history to have found a way to prevent real estate bubbles and bursts? 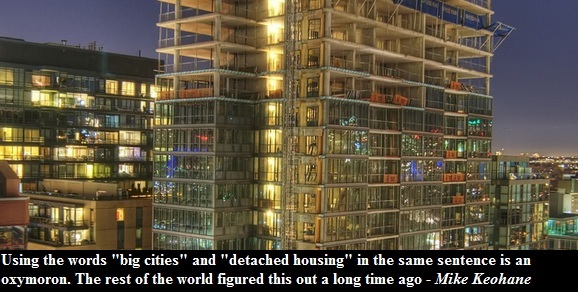 If so, what does it mean for real estate investors? ... If a solution for avoiding real estate bubbles and crashes has really been found, it would be a global and historical first. It would also be yet another shining gem in Canada’s financial crown, and could really elevate the nation on the world map. Bubble thinking is when people expect home prices to continue to rise. Bubble thinking is when people believe that a 5% annual real estate appreciation is sustainable while incomes stagnate.